1. Über-Luxury Design Challenge - With the world's economy in a constant state of flux as well as the rapid greenwashing of the auto industry, luxury brands must adapt and change with the times. Do you have what it takes to design the next generation of Maybach, Rolls Royce, Bentley or perhaps revive a long gone luxury marque from the past? 2. British Icon Revival - Remember the British icons of the past? The MGA and MGB, Sunbeam Alpine, Triumph TR's...etc. These highly loved small sports cars may be long gone but what if they made a come back? I voted "British Icon Revival". With the Chinese owned and built MG6 going on sale within the UK in May 2011, I would like to see some design studies based on the MG6 (perhaps a proper coupe version) and a presentation for a new MG sports car. The majority of the classic British marques lay in a state of extinction or have been divested and sold to foreign ownership, Leaving the British motor industry a shadow of its former self. One of the most notably missing icons on the automotive landscape is a lightweight fun to drive great-handling sports car from Britain. With a pool of classic nameplates to choose from as well as an influx of cash from a foreign investor whats' to stop the rebirth of the Classic British Roadster. of resurrecting the classic British roadster and breathing new life into the segment? Good luck designers!!! This contest will end on April 18. 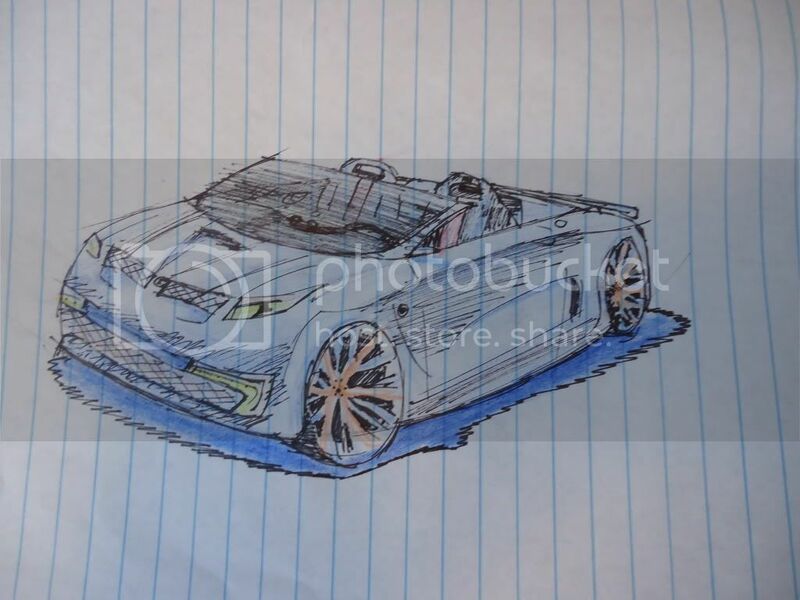 Here's my entry, an MG Roadster. I did it in class with a sharpie and 4 crayons, so it's kinda horrible. The front wheel is off by a lot, but overall not bad considering it took 10 minutes. Maybe I should have gone with the Sunbeam. Funny if we all end up sketching MGs'. Here is the new Lotus Seven. The governing idea of the design is performance and fun with practicality. So the convertible top hides behind the seats, but there is still room for a cargo space underneath it (hence the large behind). The small grill up front is to allow the small turbocharged engine to breath while maintaining a good drag coefficient, which is important to keep the car's fuel economy on par with those of compact 4 doors, despite the added performance. The number of seats, however, remains at two. I'm not entirely happy with the design. On second viewing, It looks a bit too old and I'd add a bit of sharpness and edge to it. But since I'm out of time this will do and I still love how it looks. As a Miata driver I should be able to come up with a good british roadster concept but let's see how I did! Also, I couldn't quite resolve the rear end but that's the general idea in the rough sketch. Tall with round tail lights. The inspiration for the design was the Jaguar F type concept which is one of the most beautiful cars never made. Last edited by ParanoidAndroid; 04-19-2011 at 04:47 AM. Thanks to all who participated, Voting will be up shortly. Remember NEW VOTING RULES are in effect, Score each design between 0 – 5 points. Check out the amended RULES for more details. Best of Luck Designers!!! Voting will close on May 04. Also, the The TVR Revival contest is still open if anyone is still interested. AudiR8-4 Works nice as an MG. Small and stylish in a somewhat blocky sort of way. ParanoidAndroid-2 Brings back designs of the past but not updated enough. NelsonDesign-3 A striking style that's more Nihongo than instantly British.